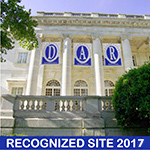 The Uintah Chapter, National Society Daughters of the American Revolution (NSDAR or DAR), welcomes you to our website! Three names were proposed for a new National Society of Daughters of the American Revolution (NSDAR or DAR) Utah Chapter: Heritage, Mount Olympus, and Uintah. Visualize the outline of the State of Utah. At the upper northeast corner there is a jog in the otherwise straight border line between Wyoming and Utah. The “High Uintahs,” as they are frequently called, parallel this jog for 150 miles with a mean width of 35 miles. They form the only range in the “lower 48 states” which has a distinct east-west axis. There are nearly a dozen peaks exceeding 13,000 feet with King’s Peak being 13,578 feet. Much of this natural wonderland is primitive area and abounds with wildlife. It was formed 60 to 70 million years ago by the earth’s great uplifting forces and later by glacial movement. The range was dissected and eroded into jagged peaks and ridges. At their base are immense amphitheaters and canyons from 1,000 to 2,000 feet deep. Five rivers have their source in this magnificent range, and these bring their life-giving water to the desert. There are many lakes, and some remain frozen over until late in the spring. Above the heavily timbered lower slopes, the barren, snow covered peaks rise majestically. Many explorers and settlers traversed these rugged mountains. Some were to remain, and some continued on to the West Coast. 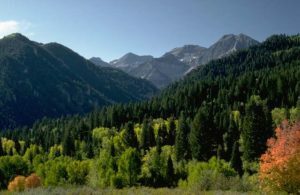 Uintah Chapter NSDAR was named for this mountain range and the Uintah Indian Tribe. Seven members were present with thirteen chapter members listed at the organization of the Uintah Chapter NSDAR on February 1, 1974, in Sandy, Utah. Our chapter meets in South Salt Lake City on most 2nd Saturday afternoons. Please contact us for further information.